In the process of turning the page, both styles of icons are able to be seen in their entirety. Once the page is turned, the die cut switches over to the left, blocking out all of the smaller icons except what can be seen in the cut. Essentially, the smaller icons now make up the larger icon. Slipcase made used to carry the books. The logo is on each side of the case. The logo created literally depicts the series because my inspiration came from the actual food pyramid. Each food group is color coordinated to the book of that group. My goal was to create pure artist books crafted to appreciate the forms held inside. The food pyramid became the concept of the project. I thought it would be interesting to create five icons for each food group, breaking the food groups down to their very core. The categories are fat, dairy, grain, protein, fruit, and vegetables. Two versions of each icon were made, and die cuts were utilized in the spreads to create visual interactions. After finishing and binding all spreads, each book was wrapped with colorful fibrous papers to enhance the naturalness of the food. Each book was also given a slipcover to display the food group. 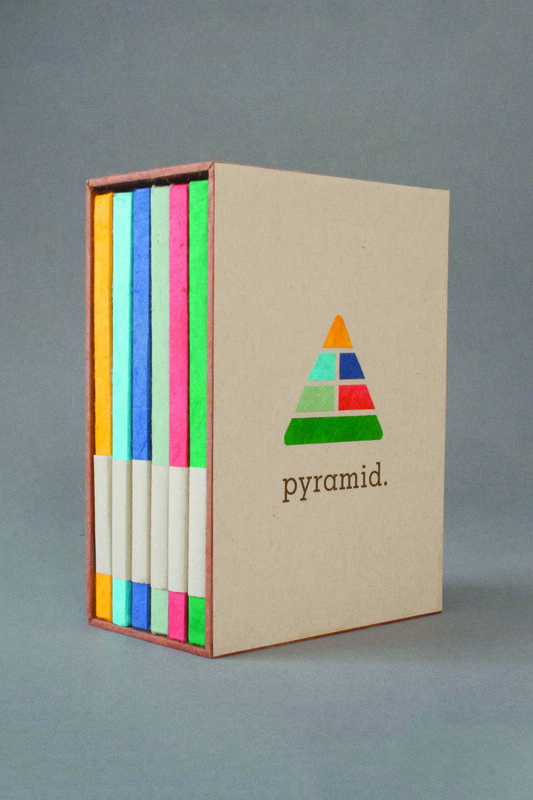 The end product is six books contained in a slipcase.